World-class powder skiing in Winter, breathtaking mountain beauty in summer, our home in Snowmass is truly "Magic in the trees". 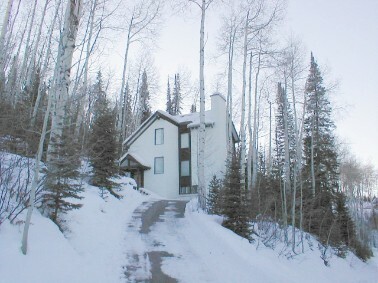 Our house is located off Faraway road, surrounded by woods of Aspen trees and tall pines. My family spent many a vacation and several whole years in this unforgettable place! Upstairs is a fully-equipped kitchen with dishwasher, gas range and stove. Living area has comfortable seating for 10+ with large stone fireplace, 20 foot (7M) beamed ceilings, and outdoor deck. Downstairs is a large bedroom has 2 singles and 2 bunks, and a third bath with tub/shower. Laundry is downstairs. In addition to skiing/boarding, there's an endless supply of activities in Aspen and Snowmass. Check links below for more info. 4wd recommended for driveway in winter. If you bring a car, 4wd is recommended for driveway in winter. If not, use the Subsidized Taxi service: For just $1 High Mountain Taxi will pickup/deliver you to the slopes, or almost any location in Snowmass Village. Call 30 minutes before departure to arrange a pick up. Dial-A-Ride runs from 8:00am - 9:00pm, and 'late night' 1AM-2AM. (subsidised by City of Snowmass Village). There are free shuttle buses from Snowmass Village Mall to Aspen Mountain. Check schedules online or when you arrive. (Buses and/or regular taxi rates apply for airport, Aspen, or other destinations). - Aspen Rec Center: Ice rink, 3-story climbing wall, water park with 100meter water slide (Snowmass has rec cen with pool too). - Visit the Glenwood Adventure park, with mile-long natural underground cave tour, bungee jumping, 'alpine sled' (like a personal racecar on roller coaster track - very cool! ), Canyon swing, climbing wall, trapeeze trampolines, etc. etc. 45 min drive down the valley to Glenwood Springs. - Whitewater rafting on the Roaring fork river. Even my wife had to admit, this was the best part of the trip! - Rent a 'downhill mountain bike' for the thrill of your life: Take the gondola up (about $40/person/day) to Cafe Suzanne - with your bike -- Have an awesome hamburger, and then ride down the exciting trail to the village again - woohoo! - Or, just hang out on the deck surrounded by the woods: In summer, the back deck is quite possibly the most peaceful place on earth. You are completely surrounded by woods. Read a book, listen to music, or just zone out listening to the fluttering of Aspen leaves in the breeze! You won't get this experience in a condo! - Powerline trail that takes you over to Elk Camp and the Government trail (that goes all the way from the Snowmass Village to Aspen). - Tom Blake trail (Awesome for mountain biking with the kids - mostly traverses over soft ground, 1 creek crossing) traverses into Owl Creek and connects with the paved bike path. The kids can explore the woods and build forts. It's heaven!